The Parish Council, in association with residents, is progressing investigations by Yorkshire Water, ERYC and riparian land owners to determine the cause(s) of surface water flooding within the village, particularly regarding recent events in 2015/16, with a view to improving the system to mitigate any future flooding events from occurring. 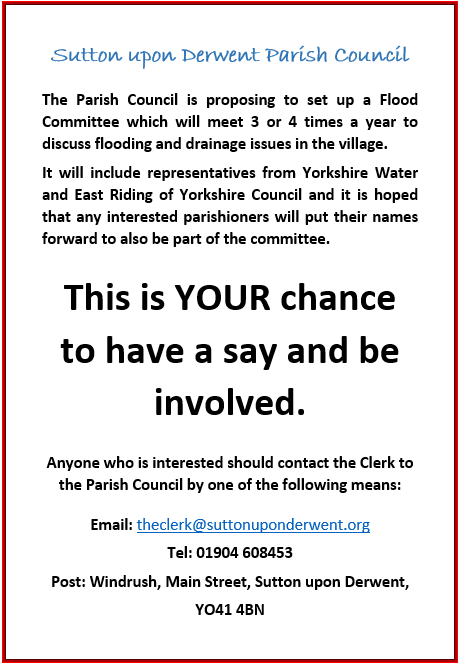 As a result of Parish Council discussions with the relevant authorities, we are calling for volunteers to develop a Flood Committee. If you are interested, please contact the clerk. The Environment Agency provides mapping of areas susceptible to surface water flooding. Below is an extract for the majority of the village which parishioners may find this useful for reference.